I felt it necessary to change the Double Dose up this week, rather than hit two groups of musicians we will split a double album, due out mid July. What better album… what other album, than Baroness’ Yellow and Green. 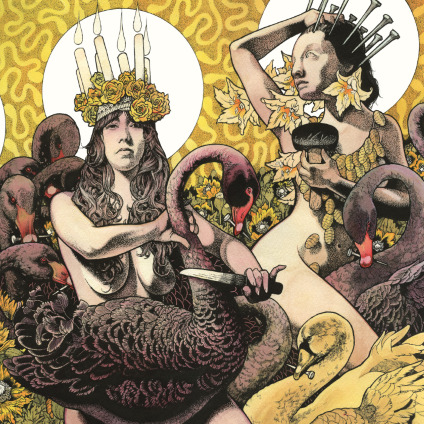 I had extremely high expectations for this release knowing that Baroness was the band that dragged me deeper into the extreme and intricate underground metal scene. With the 2009 release of Blue I found myself hooked on the dual guitar glory, John Baizley’s southern gruff and the outstanding artwork. Knowing the band were down to earth guys (after meeting them on the 2010 Volcom Tour) and their strict no compromise on creativity and live performance-as-art mentality, I had high hopes for Yellow and Green. And my friends I was not disappointed. Don’t believe that Baroness has made something more mainstream or commercially popular (AKA sellout)… John and the gang have kept the entire movement deep rooted in art and creativity and you just have to respect that. The guitar tones remain drenched in that Virginia sweat and new bassist Matt Maggioni (Unpersons) picks up right where Summer [Welch] left off. 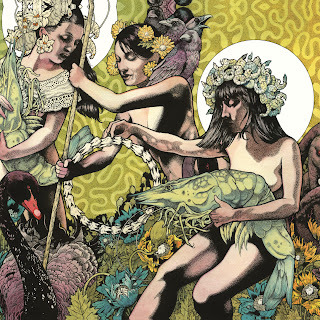 Baroness have proven something unique throughout the past ten years… metal is more cultured than ever and reaching to a wider audience, endlessly. Therefore I send my deepest thanks to the band for Yellow and Green, Thank you!